The Asparagus Fern, really a member of the Lily family, has three popular varieties, all easy for any Indoor Gardener to grow in pots or in hanging baskets. The most common - Asparagus Sprengeri - is covered on this page. You can read about the slightly different information and care of the closely related Foxtail Fern on its own page. 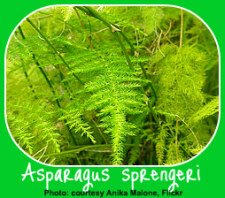 A deceptive plant, the Asparagus Sprengeri looks halfway between a lacy, lightweight fern and the top of an asparagus - hence, its common name. This easy-to-grow houseplant looks good on tabletops or in hanging planters. 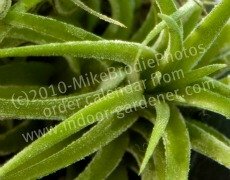 The stems of this evergreen perennial can trail and climb, and they swoop gracefully up and outwards, which is why so many find their homes swinging in baskets from the ceiling. It responds well to trimming and pruning, so you can keep the tips from getting too long. Use gloves, as it can scratch you with its small, hidden thorns. 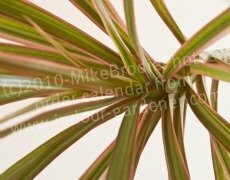 In addition to the Foxtail Fern, the Asparagus setaceus, or Plumosa Fern is popular for the Indoor Gardener. It has a more airy, layered look, with spreading stems and soft, small needles. Watch out, though, for its climbing shoots - they'll wrap around anything available. The Asparagus retrofactus or macowanii - the Ming Fern - is less common. Tufts cluster on thorned branches and grow into a semi-cascading shape. 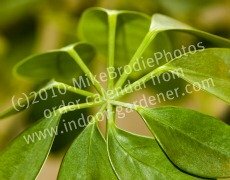 Left to its natural habits, it will grow into a bright green, bushy plant. 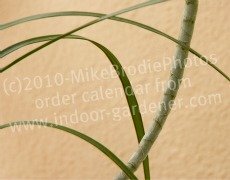 The Asparagus Fern has the reputation of being almost indestructible, indoors or out, so if you're a beginning Indoor Gardener, this is a good one to try. Yellow foliage means it's thirsty; brown means it's drowning. Cut off old or yellowed stems at base. Cut ends of stems to keep it well shaped. Seed: Berries hold dark seeds. Root Division: Keep tubers connected to foliage as you separate it; roots can get woody and tough with age. Give roots lots of room to grow in new containers. Keep the crown at soil level. 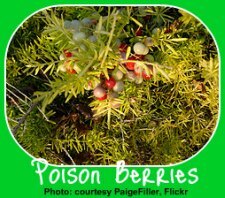 FRIENDLINESS FACTOR: Easy to grow, but the Asparagus Fern may poke you with its thorns, so wear gloves when trimming it. This is plant is not friendly to pets. In fact, it's toxic. So unless you can hang it high out of reach, don't grow an asparagus fern if you have pets. The Asparagus Fern could be called the Great Pretender. It's not really a fern because it propagates by seed rather than spores and has branches rather than fronds. It's not an edible vegetable like the asparagus, either, because it's poisonous. Its leaves look delicate, but they hide sharp thorns. And they're not really leaves at all but cladodes, which function like leaves but are parts of the stem. 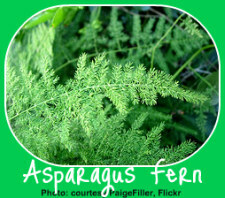 The Asparagus Fern grows by tuberous roots and seeds and spreads easily throughout gardens, especially in warm climates. Once established in an outdoor garden, it's almost impossible to limit or get rid of this perennial shrub. The states of Florida and Hawaii as well as New Zealand have declared it a weed, or "exotic pest" that endangers native flora. More closely related to hostas, tulips, and daylilies than to ferns, it's available to the Indoor Gardener in about four different varieties.